I have finished a new Color Grid quilt. The sweater insanity and the studio remodel have meant I have spent very little time making quilts in the last four months. That’s all gonna change starting right now with the completion of This Quilt is Technotronic. In celebration of this move in the right direction, I thought I would share with you the journey of making this quilt–which is pretty much the story of how all my quilts get made. 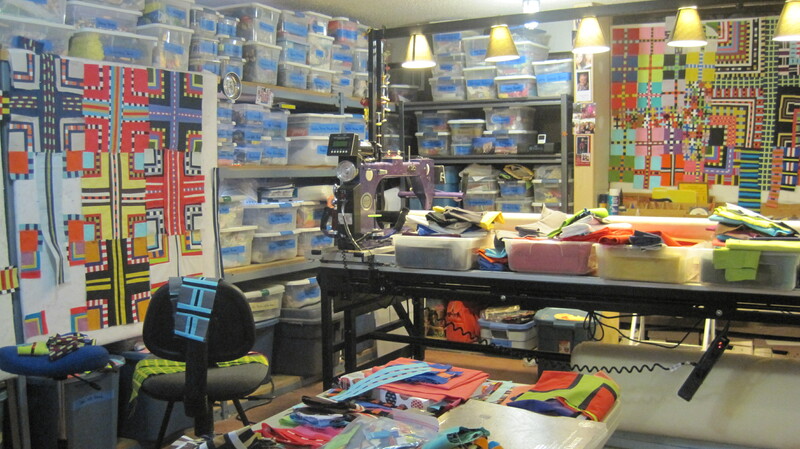 I stitch and stitch, then I put everything up on the design walls and start moving things around. I stitch some more. I move things around until finally one of the ideas on the design wall says very loudly. “You’ve got it! I’m a good one! Finish me!” Sometimes they are lying, and I’ve got to accept that. Everyone makes a dud once in a while. Technotronic first showed up in the spring of 2011. 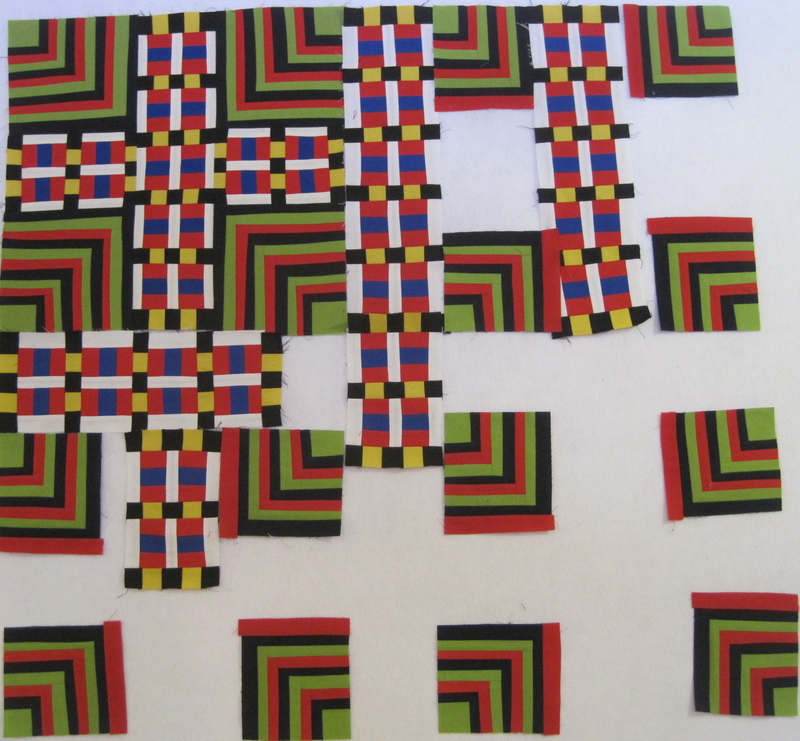 I was just beginning to make Color Grid quilts. 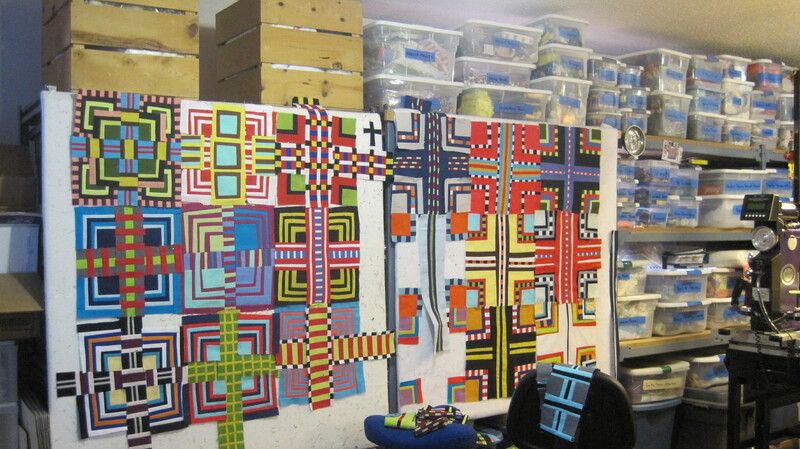 In all honesty, I did not know that I was on my way to making a series of quilts–I was just doing what I always do which is throw stuff up on the design wall and see what happens. In the beginning, Technotronic was trying to make its way into the quilt Dance Party at Tamara’s House, but it didn’t make the cut. Or maybe I decided it really did deserve to be its own quilt. I should take better notes. Can you see it? It is in the upper right hand corner of Dance Party. Here is a large view of the studio at that time. There is some serious chaos going on. I must of have liked this block as I actually took the time to photograph it by itself. This is the final version of Dance Party. The lower right corner block is part Techno and part something else. 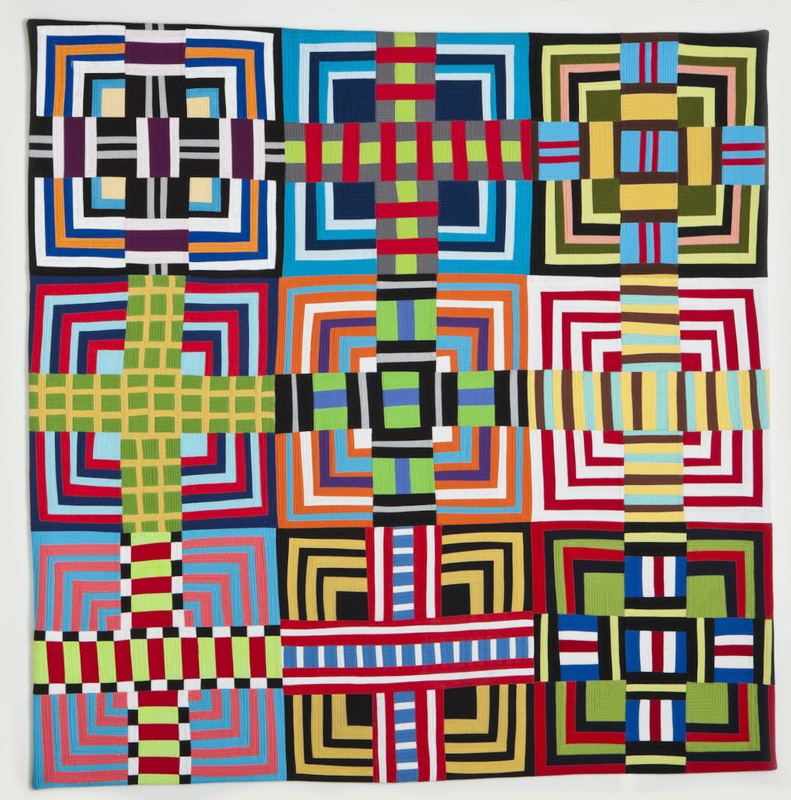 When I was making Dance Party, I had not yet hit upon the idea of repeating the block over and over again through out the entire quilt. Eventually I figured it out–that repeating the block can create some crazy stuff to look at. I would say that happened sometime over the summer of 2011. I must of really liked Technotronic as in this photo it has a design wall all to itself. Here is what is on the other design walls. 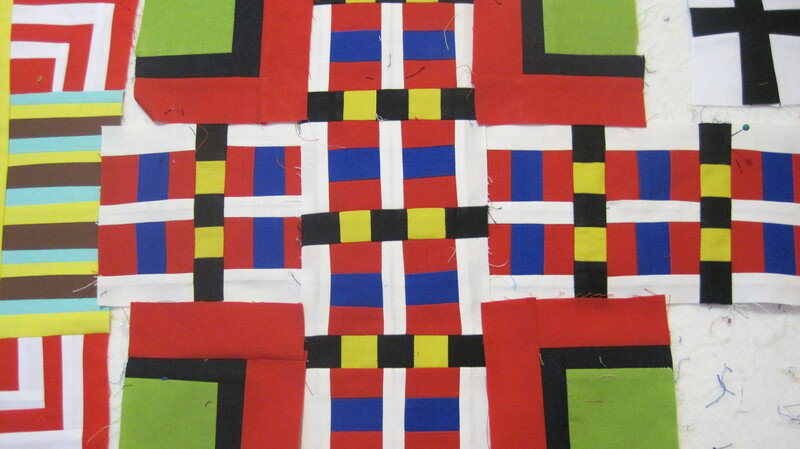 I am always kind of surprised at what quilts are started together and then what quilts actually get finished. Everything surrounding Technotronic has actually been finished. When I like an idea, I usually build a small version–a prototype to test it out. I then decide if I want to make a full Color Grid quilt. In October of 2011, I finished the pro to-type for Techno and then I put it away for almost a year and a half. I didn’t get back to this quilt until this month when I decided it was going to be one of the projects to travel out to McCarthy for spring break. I needed to take projects that were past the design stage and really just about stitching. It’s too hard for me to think when there is a Risk game going on in the background. Technotronic on the design wall in McCarthy. This week, I gave Technotronic all of my energy. Once the grid is made, things slow down considerably. I really can only stitch one seam at a time as I am carefully fitting each section to the next section. Technotronic with all of the background squares completed and some of the grid work. The grid work for Technotronic. This was a very sad moment for me. I knew better–You can’t make the grid until the background is done! If you do they may not be the same size. These grid pieces are not like each other. So I had to take them apart and shave just the tiniest bits of fabric off of each section–so that the proportion of the design stayed the same, but the pieces got smaller. This is a pile of my shavings. This is a restitched section. You can see the old stitch marks if you look closely. Now I am ready to attach the first row to the first long grid section. I heavily pin when I do this part. I also give it a good press. You are the boss of your fabric. You are capable of willing it into place. Row one plus the first grid row. Row one plus grid and part of row two. I build each row by constantly checking it against the grid. Row one plus grid and row two. This would be easy if I used rulers, but it is the lack of ruler usage which creates the vibrating sensation that happens with these Color Grid pieces. 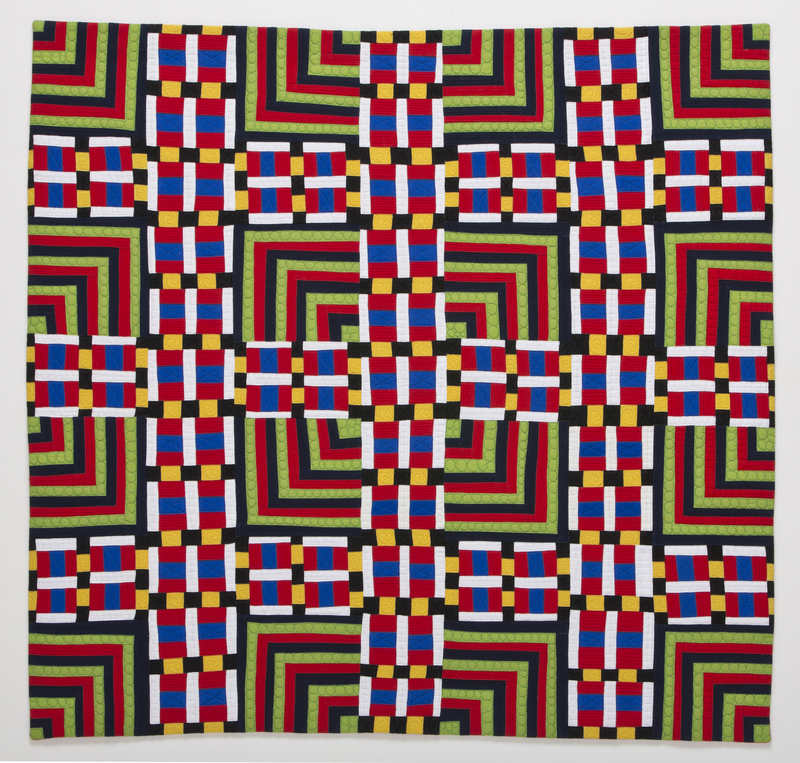 Your eye thinks the sections of the quilt are all the same, but it also senses they are not which creates a dissonance for the eye. I love this. As always happens on Fridays, I am adding this post to Nina Maria’s Blog. Please visit and check out what fiber artists from around the world are working on. It’s very inspirational. 22 Mar	This entry was published on March 22, 2013 at 1:21 PM. 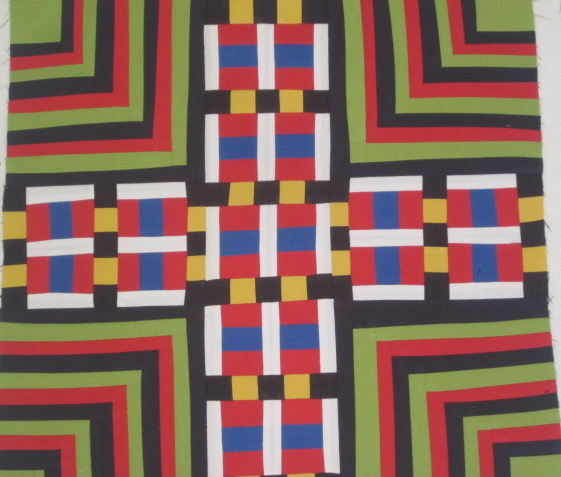 It’s filed under Quilt Stories and tagged Color Grids, This Quilt is Technotronic. Bookmark the permalink. Follow any comments here with the RSS feed for this post. sometimes I think I’m working hard on a piece – then I get a dose of hard reality and see how hard you’re working — this is quite something – the intricacy just floors me! funny how much movement you can get from something so geometric and solid. Nina-Marie- Thank you for hosting Off the Wall Fridays! It is genius. I love seeing what artist from around the world are up to. I LOVE this post! Thank you for spending so much time to SHOW so much of the beginnings- the origins- of Technotronic- and the like. And thanks for detailing the many careful steps to it’s creation. This floors me. I love it- the quilt, your process, etc. I can’t say enough! Thank you so much for your kind words. Wow. It makes me feel good to know that what I share has value to someone else. Thank you. Wow – I love this. So vibrant. Jiminy Christmas! This is something I could get interested in! LOVED looking at these pictures! WOW! Your work is astonishingly wonderful! 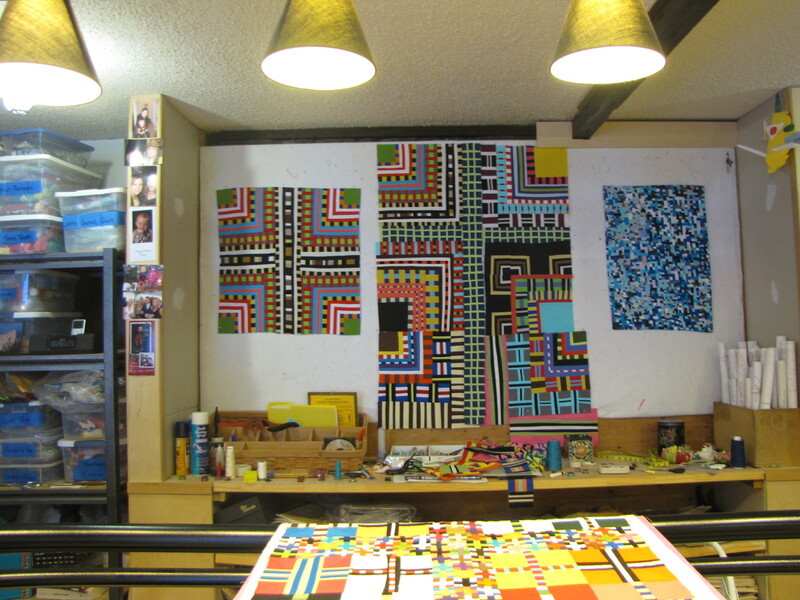 And I think I want to sit in your studio for a couple of hours, just to be surrounded by the fantastic color vibrations! You should give studio tours! Thanks for the backstory! Thank you Cathy. If you are Anchorage, I’d love for you to come see my space.